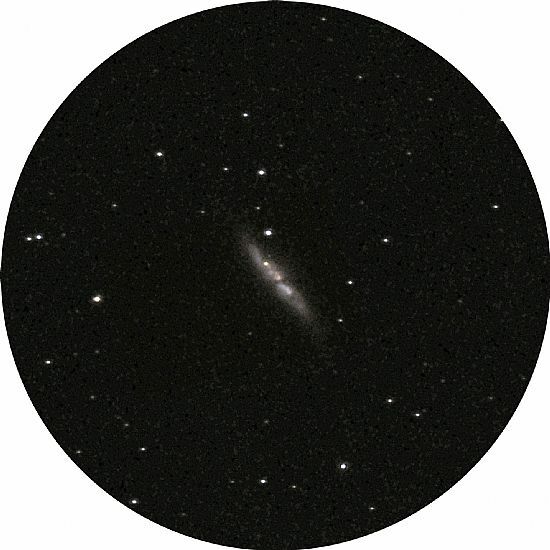 New Supernova in Galaxy M82. The original NOVAE page has apparently been corrupted making it impossible to add data. Meantime, we shall keep the page (this page) up on site for reference but additions may now be found on a NOVA 2 page. Update 2014 February 27. 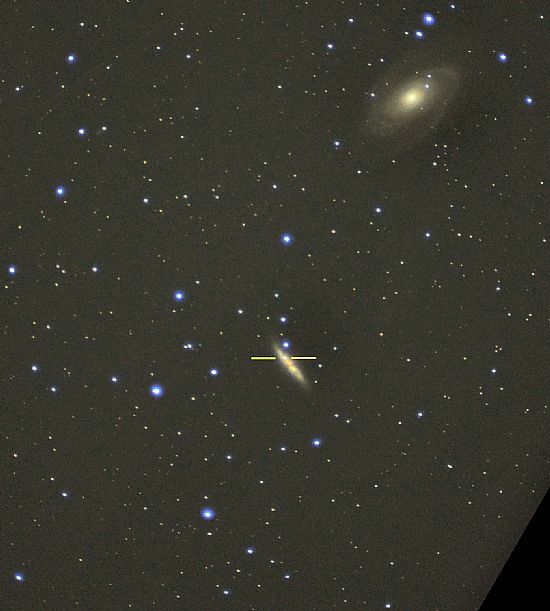 Supernova (SN 2014J) in M82. Observations of the supernova (indicated between the two yellow lines) went ahead despite the zenith being awash with light from the aurora throughout the period of observation up to 22h UT. This particularly interesting image was obtained against a dominant orange backdrop. Considerable processing was required to show stars to 16.5 magnitude. Imaged with 132mm f/7 apochromatic refractor coupled to a D800 SLR. A 32.3 sec., exposure ISO 2000. Field diameter: 40 arc-minutes approx. Update 2014 February 25. Supernova (SN 2014J) in M82. Update 2014 February 23. Supernova (SN 2014J) in M82. 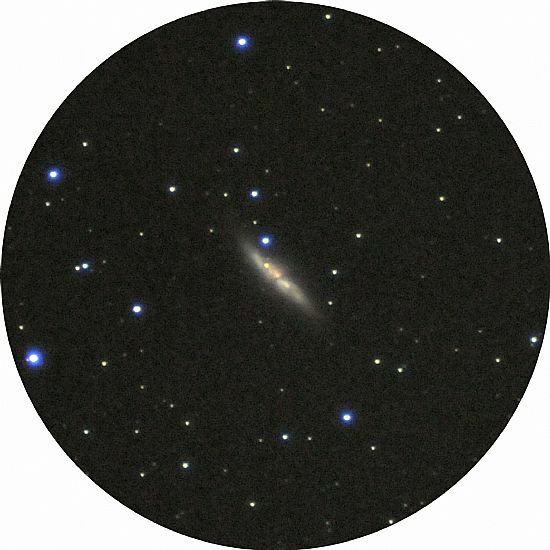 M82 imaged 2014 February 23 at 19h 43m UT. 200mm f/8 Ritchey Chretien reflector. A 50 sec. exposure D 300, ISO 1600. Wind S, force 6 to 7 causing some instrument shake and thereby limiting length of exposures in addition to strong auroral glow, sometimes reaching to the zenith. M82 altitude at time of observation: +62° 43'. (See Auroral page.) Cropped image - left click to enlarge. Update 2014 February 20. Supernova (SN 2014J) in M82. Update 2014 February 10. Supernova (SN 2014J) in M82. 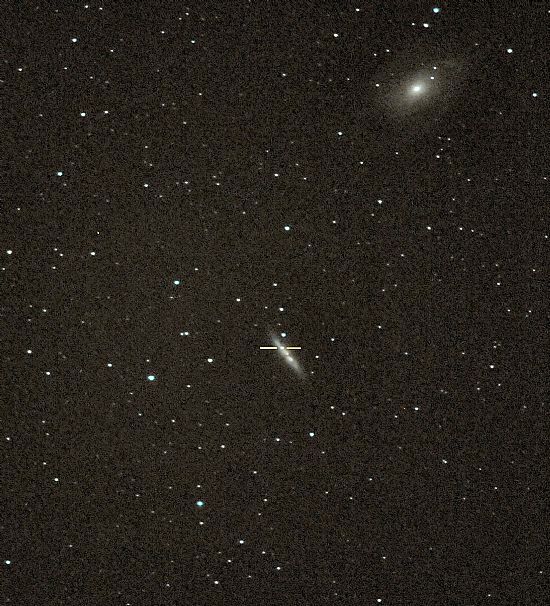 Galaxy M82 imaged 2014 February 10 at 04h 48m UT. A 40 sec. exposure D300 SLR: ISO 1600, 150mm f/5 achromatic refractor. The nova is shown between the two yellow lines. (Cropped image.) Note: some brightening appears to have taken place since the previous observation on 2014 February 04. Current estimated apparent magnitude 11.1. Update 2014 February 04. Supernova (SN 2014J) in M82. Images taken with the 150mm aperture f/5 achromatic refractor on the night of 4th February would indicate that the nova has faded over the past two days almost halving in apparent brightness to magnitude 11.4 or thereabouts. It is difficult to make a direct comparison with nearby stars since the nova is viewed against the bright background of gasses in the galaxy itself. Moreover, direct comparisons are more problematical when using different apparatus. The work was carried out with some difficulty – fast moving cloud in a force 6 - 7 wind gusting to 8 at times. Attempts to image with the longer focal length 132mm f/7 apochromatic refractor failed due to wind shake. 2014 February 04 21h 27m UT. A 55 sec. exposure 150mm f/5 achromat. D800 SLR ISO 1600. Note the bluing of many of the brighter stars due to inferior colour correction on this doublet lens. Stars to magnitude 16 are clearly seen despite a backlit sky from the Moon (phase 30.7%, altitude 17°). 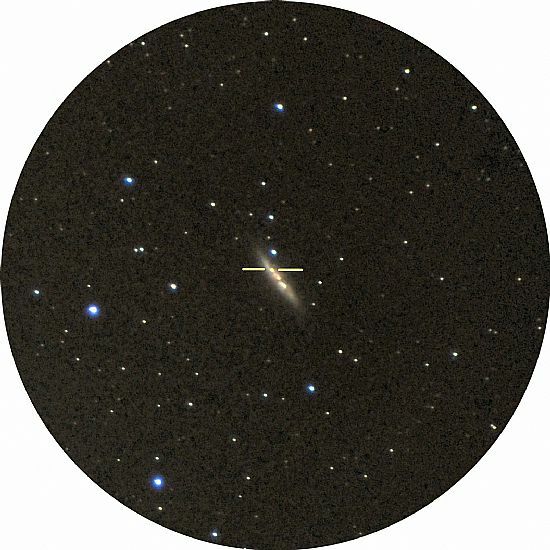 It is worth noting that at the time of this observation M82 was close to the zenith and ideally positioned for recording faint stars etc. But for the presence of the Moon, longer exposures would have been given that would have stretched the magnitude limit for stars to around 17.5. 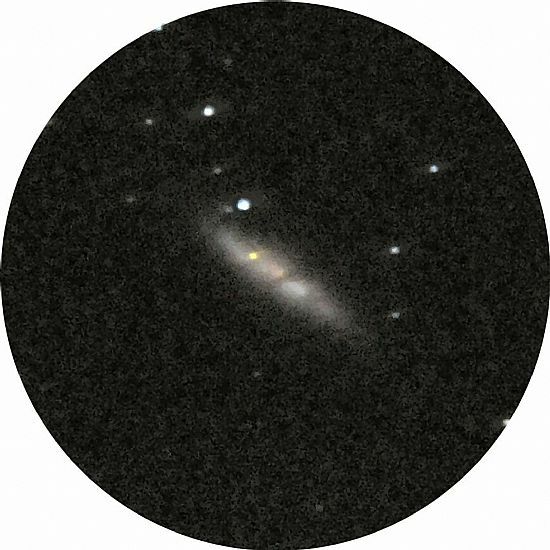 The Supernova (designated SN 2014J) in the galaxy M82 in Ursa major (one of a pair of galaxies, the other M81), was discovered quite fortuitously—as these things often are—when Steve Fossey, of the University of London Observatory, Mill Hill, was instructing a group of undergraduates using a 350mm Schmidt-Cassegrain on 2014 Jan. 21at 19h 12m UT. Weather throughout the UK has been appalling (we have only managed a few hours in the dark hours over a period of one month here in Orkney). 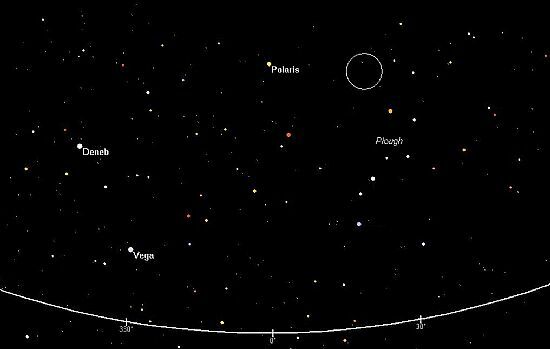 Our first attempt at recording the nova occurred during a brief break in cloud on the evening of February 02. Strong winds prevented use of larger instruments. M82 has an integrated magnitude of 8.6 and M81 7.0. They can been seen with a modest 100mm refractor. Moreover, the present magnitude of the nova is well within the range of such an instrument. A location diagram is given below with the galaxies at the centre of the white circle. 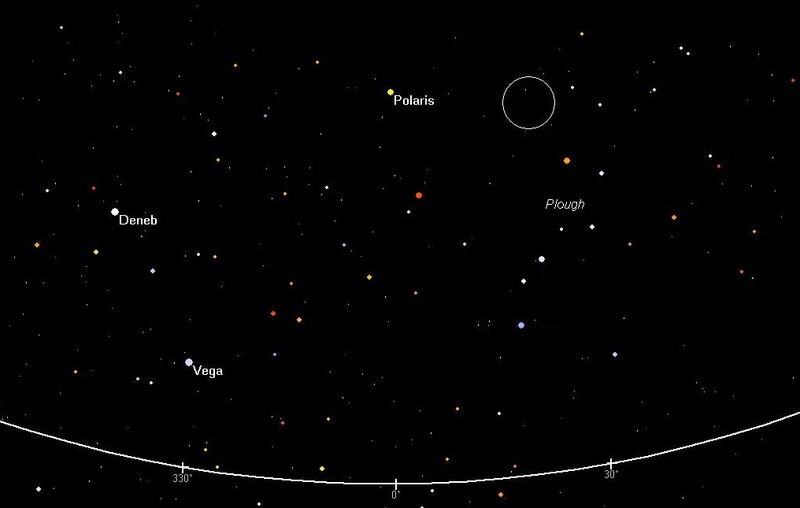 The sky is shown looking due north at 19h 00m UT on February 04. I used to give public demonstrations on clear nights at the Mill Hill Observatory in the late fifties and early sixties using the fine 200mm Cooke refractor that has since been fully refurbished. The position of the nova is shown between the two yellow lines. The “bright” star close-by, just above the nova, is TYC 4383-2050-1, apparent mag. 10.05. The magnitude of the nova is estimated at 10.7. Imaged 2013 February 02, 19h 08m UT. Nikkor 600mm f/4 D300 SLR. A 50 sec. exposure ISO 1500. Seeing and transparency variable form medium to good but with strong SSW wind force 6-7 limiting observations to this “smaller” lens. Ideally, under calmer conditions, one would have used a focal length at least double that of the 600mm Nikkor. Note the larger and somewhat brighter galaxy M81 above, right. Field 1°.4 x 1°.3 approx. M82 distance from Earth 11.42 million light years.